I don't usually read through all of the text included with these Radio Service Data Sheets, but I did see at the end of this one where instructions are given for increasing the sensitivity of the units. Capacitor value increases are made in the dynatron oscillator circuit, which is the beat frequency oscillator (BFO) in the received signal path. 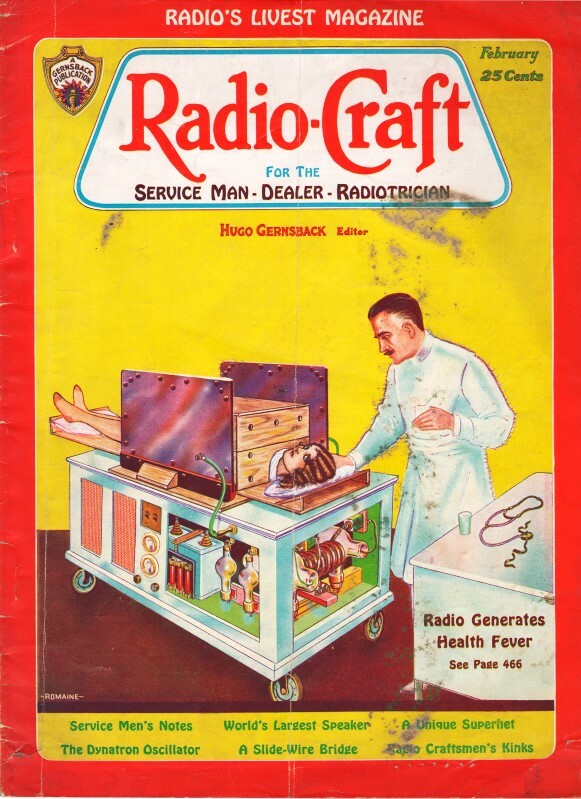 Why wouldn't that have been incorporated in the factory-built radio? My guess is that the tuning process would take more effort than a typical owner would be willing to tolerate. I could not locate a photo of the Model 826B. 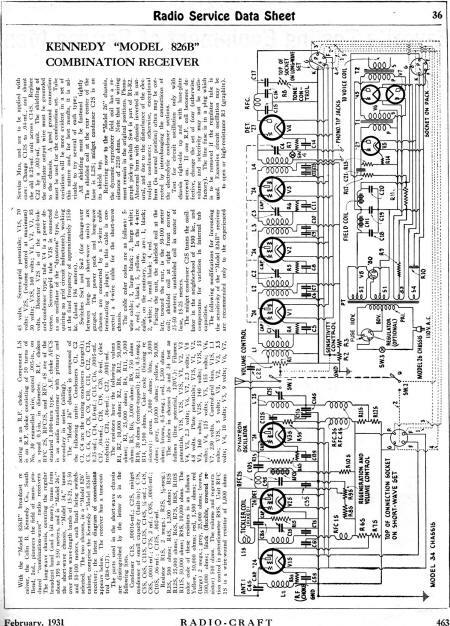 With the "Model 826B" broadcast receiver , the Colin B. Kennedy Co., South Bend, Ind., pioneers the field of mass-produced "combination-wave" radio receivers The long-wave chassis, covering the regular broadcast band (and a bit more), tunes from about 195 to 550 meters, and is "Model 26;" the short-wave chassis, "Model 34," tunes over three wave-length bands of 15-25, 25-50 and 50-100 meters, each band being switch-selected. 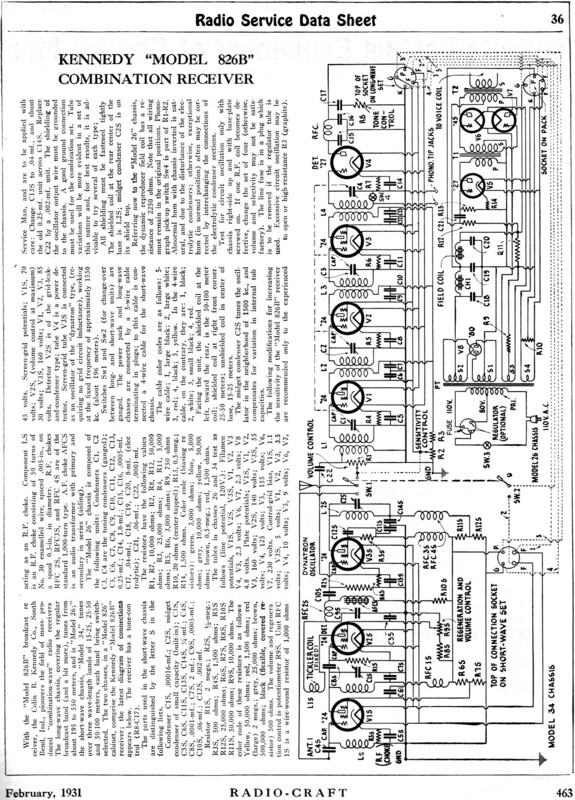 The two chasses, in a Model 826 cabinet, comprise the Kennedy "Model 82613" receiver; the latest diagram of connections appears below. The receiver has a tone-control (R8-CI7). The following modifications for increasing the sensitivity of the "Model 826B" receiver are recommended only to the experienced Service Man, and are to be applied with care: Change C13S to .04-mf., and shunt the old 0.25-mf. unit across C14S. Replace C22 by a .002-mf. unit. The shielding of the oscillator output wire must be grounded to the chassis. A good ground connection must be used for the combination set. Tube variations will be more evident in a set of this nature and, for best results, it is ad­visable to try several of each type. All shielding must be fastened tightly The shielded coil at the rear center of the base is L2S; midget condenser C2S is on its shield top.